I spent 3 weeks in Japan in November 2015 exploring Tokyo, Matsumoto, Kamikochi, Takayama, Shirakawa-go, Kanazawa, Uji, Nara, Kyoto, and Osaka. This is my second trip to Japan in November. It’s a great time to visit, since you can admire the changing of the leaves, and the weather is cool and crisp. Possible downsides: November in Japan can be pretty chilly in the Alps region. Also, you may encounter hordes of leaf peepers, especially in the south where autumn color is still peaking. Getting There: I flew non-stop to Narita from Denver using United miles. Airport Info: There are plenty of international ATMs at the airport you can use to withdraw cash. Note that 7-11 ATMs have a maximum withdrawal limit of ¥100,000. My flight arrived in the late afternoon, so I was able to take the inexpensive Access Express commuter train that runs after 4pm to Ueno (¥1240, or about US $10). Getting Around: I didn’t get a Japan Rail Pass this time since I was traveling relatively slowly and not covering large distances with each stop. I did the math using the outstanding Japanese transport planning site Hyperdia, and the pass wouldn’t have paid for itself. Also, a couple of the places I visited like Kamikochi were only accessible using private bus lines. Japanese buses are comfortable and punctual; they take longer than the train but are much cheaper. Not having a JR pass also meant I could choose to travel on private rail lines like Kintetsu when it was cheaper and more convenient. Tokyo Subway Navigation for Tourists. Works offline and is indispensable for figuring out the maze that is the Tokyo subway. MAPS.ME Offline Maps. Google Maps does not offer offline maps in Japan, so this app is a lifesaver if you don’t have a data plan. Japan Connected-free Wi-Fi. Worked pretty well at finding free hotspots in public areas. Digital Compass. Useful when I would emerge from the subway or a bus completely disoriented as to direction. I stayed at the comfortable and budget-friendly Ryokan Sawanoya in Yanaka, about a 20-minute walk from Ueno station. 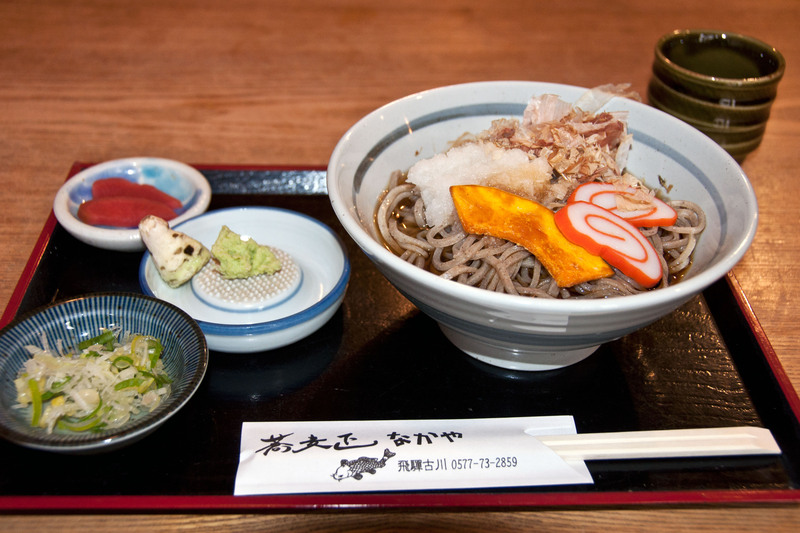 Yanaka is a charming neighborhood with dozens of temples, traditional shops, and winding alleyways to explore. One of the first things I did in Tokyo was get a PASMO smart card from a metro station to use for public transport in Tokyo and other cities with compatible smart card networks like Kyoto and Osaka. One of nine shared EatWith dinner courses. Photos courtesy of our host, Shin. 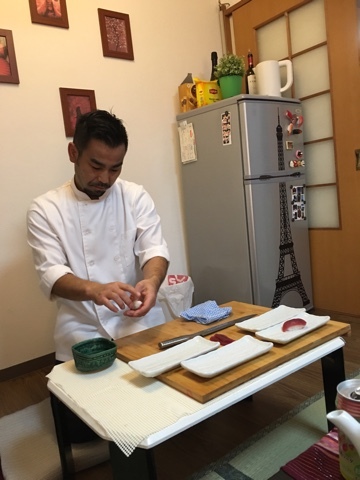 Our EatWith host, Shin, preparing sushi tableside. I also spent one day with a volunteer guide from Tokyo Free Guide. My guide, Yoshi, emailed with me in advance to create a detailed itinerary based on my interests. 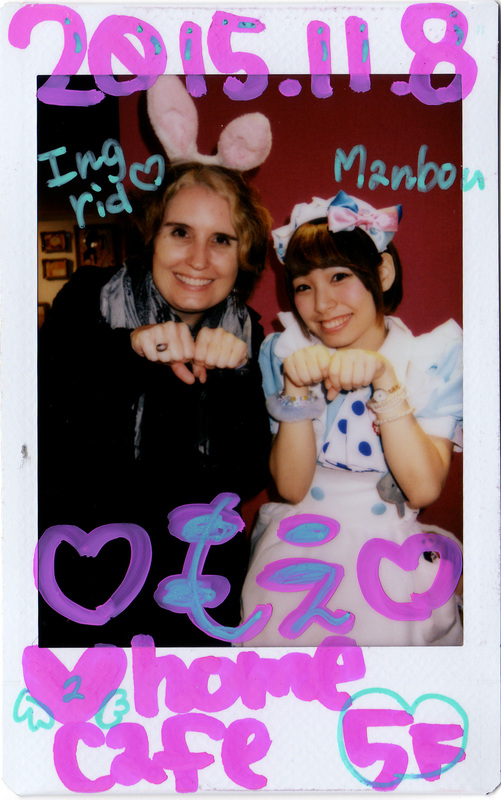 I had requested a visit to a maid cafe, so we checked out this one in Akihabara. What a bizarre and fascinating experience this was! This particular cafe was foreigner-friendly with some English-speaking staff, but I was still glad to have Yoshi there to translate and explain things. I took the bus from Shinjuku station to Matsumoto (make an online reservation for the bus here). It took a little over three hours but was much cheaper than the train. Matsumoto is a pretty little town and was mercifully devoid of tourist hordes. The last remnants of fall color were lovely and exploring the castle and the town itself made for a pleasant day. I traveled to Kamikochi using the combined train/bus ticket from Matsumoto Dentetsu Kamikochi line. You can only buy tickets from a machine, not the ticket office, and you cannot buy the tickets in advance, only for today’s date. Once in Kamikochi, I checked my bag at the left luggage office and spent several hours walking the loop that follows both sides of the riverbank. It was an easy stroll. It was just a few days before Kamikochi closed for the season and there were few other tourists. Kamikochi was pleasant but aside from the breathtaking views around the Kappabashi (Kappa Bridge), from which every visitor must snap an obligatory photo, I did not find the scenery especially spectacular. There are other trails, which were already closed for the season, that probably offer more challenge and variety. I took the Nohi bus from Kamikochi to Takayama, which required a change at Hirayu Onsen. Try the delicious Hida beef croquettes while you are waiting for your bus at the onsen. Takayama is a charming little town and very fun to explore. It’s not that big though and I think you could see most of the sights in a day. On my second day I went to Hida-Furukawa, a small town a half hour outside Takayama and did the informative town walk tour with Satoyama Tours. Satoyama is an excellent outfit and if I’d had more time I would’ve taken more of their tours, like their signature cycling tour or the sake and tapas tour. Hida-Furukawa is definitely worth a half-day visit even if you don’t do a tour as it’s strikingly similar in layout and architecture to Takayama, but much less touristy. Next I took the bus to Shirakawa-go from Takayama train station. 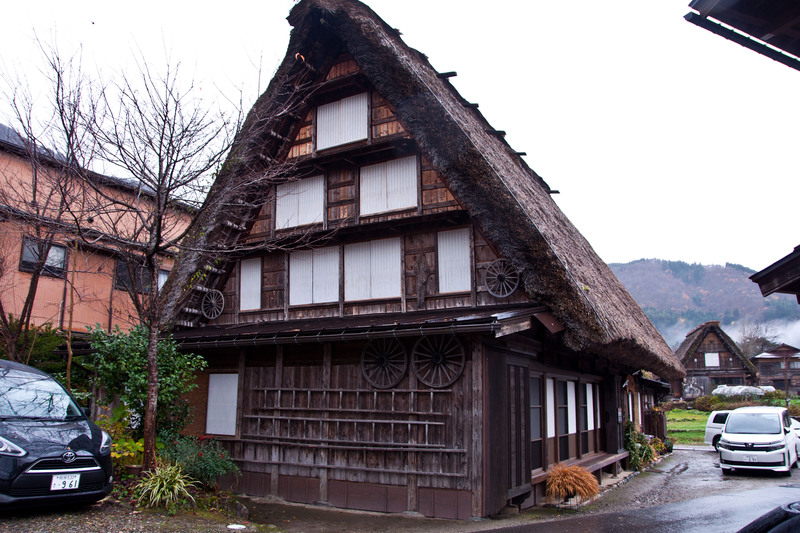 Shirakawa-go is famous for its traditional gasshō-zukuri houses, and it was interesting to walk around the village, admire the houses, and visit the museums to learn about the traditional way of life. There is also a beautiful overlook over town that’s well worth the short climb. Unfortunately, the day got rainier and rainier, so I finally gave up and went to the onsen at the far end of town to soak until my minshuku (family-run bed and breakfast) opened for check-in. The onsen offers a discount for people staying at local inns. They do charge for towel rental so bring your own washcloth and towel if you can. My minshuku was one of many gasshō-zukuri houses that have been converted to inns. It was an interesting experience although apart from the irori hearth in the dining area I’m not sure the interior looked that much different from any other traditional Japanese home. 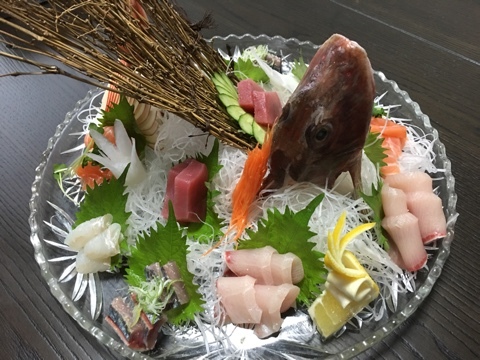 The best part was the elaborate dinner and breakfast that were served by the irori in the dining room. I shared the minshuku with a large group of Thai women. Throughout Japan I was struck by the number of southeast Asian tour groups; apparently numbers have surged due to a relaxation of visa requirements and to the weakened yen. From Shirakawa-go it was yet another Nohi bus ride to Kanazawa, where we got dropped off at the train station. Kanazawa has gotten a lot more popular as a tourist destination since the Hokuriku Shinkansen enabled day trips from Tokyo. I didn’t find it too insanely crowded, though. Kanazawa has a reputation for being rainy and in fact it rained on all but one of the four days I was there. 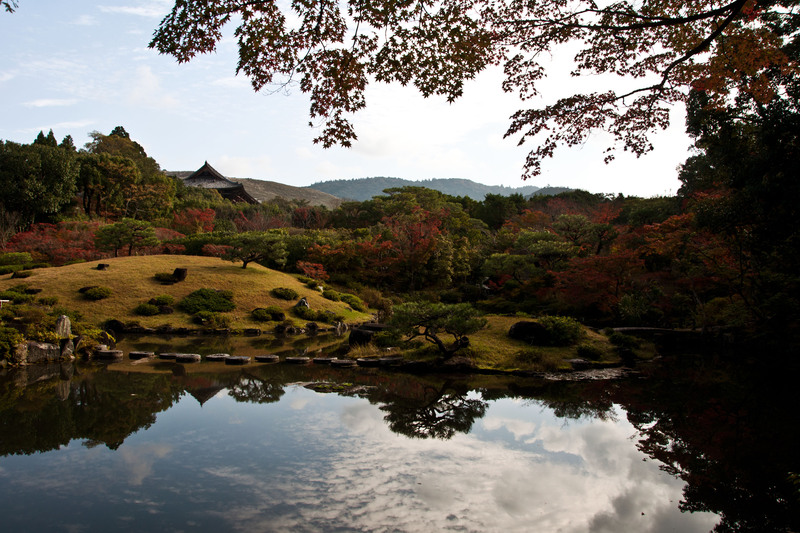 In Kanazawa, a convenient tourist loop bus that stops at the train station hits all the major sights: Kenrokuen Garden, Kanazawa Castle, Omi-cho Market, and the geisha and samurai districts. 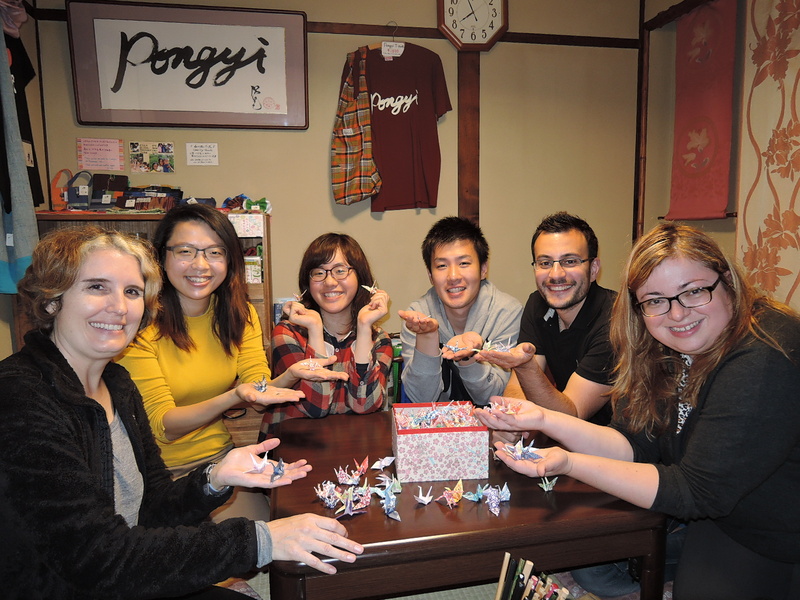 Creating origami cranes for a peace project at Pongyi Guesthouse, Kanazawa. Photo courtesy of Pongyi. I stayed at the wonderful Pongyi Guesthouse, a friendly budget hostel devoted to introducing its guests to Japanese culture. In the four days I was there, we learned about Shinto together at a shrine, made miso soup, shopped for and cooked Japanese hotpot, tried origami, attended a tea party, tried on a kimono, sampled natto, and went to a public bathhouse. All these activities were free or very reasonably priced. From Kanazawa I took an inexpensive commuter train to Kyoto and then changed to a local line to Uji. I arrived in Uji around 11am and managed to snag the very last luggage locker in the train station. I made a beeline for Uji’s most famous sight, the Byodo-in. Unfortunately even mid-week the wait for timed tickets to enter the temple was already two hours, so I decided to skip the interior and content myself with seeing the outside and the museum. If I could’ve done it again I would’ve visited Uji as a day trip from Nara or Kyoto and gotten there first thing in the morning. Uji is famous for its green tea and for an ice-cream lover like myself, no trip to Uji would be complete without matcha ice cream. The wait at the most famous green-tea themed eatery, Nakamura, was already extremely long, so I contented myself with buying a matcha cake and ice cream container to go from their shop. Oishii! From Uji I continued on to Nara and spent a lovely two full days exploring the park and the various temples and gardens. 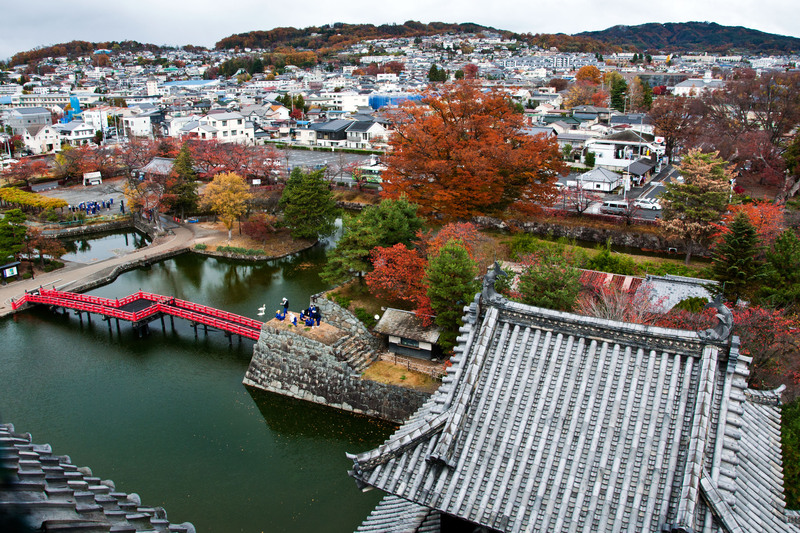 I particularly enjoyed the southern Naramachi merchant district with its traditional architecture, narrow lanes, and tranquil temples and gardens. After two full days, I was running out of things to do, so on my third day I went to Kyoto to meet a friend of a friend. It was Labor Thanksgiving Day, a national holiday, and both Kyoto and Nara were positively heaving with Japanese families out to enjoy their day off. Still, the crowds were good-natured and there was a festive feeling in the streets. 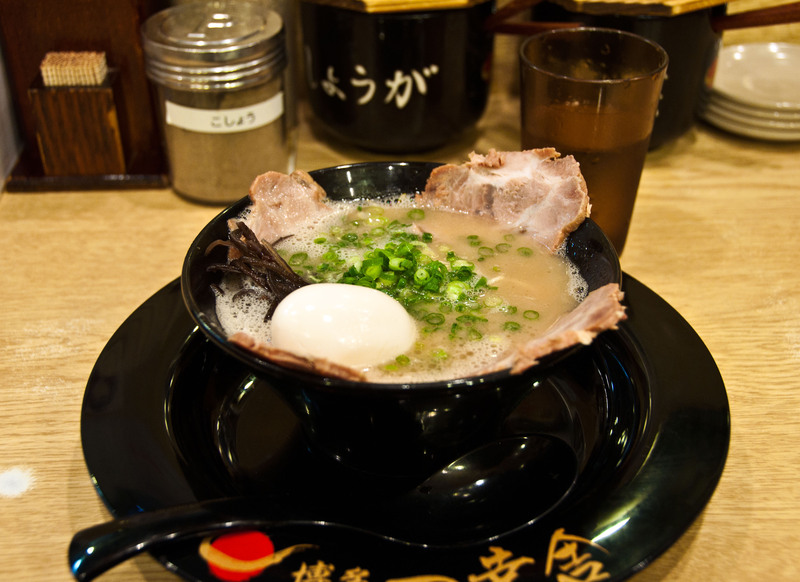 While in Kyoto I took advantage of Kyoto Station’s many culinary charms, enjoying incredible tonkotsu ramen at Hakata Ikkousha (博多一幸舎) in the station’s Ramen Alley on the 10th floor. Afterwards I visited the Kyoto Station branch of Nakamura to treat myself to yet another green tea ice cream, this time from the takeaway soft ice cream parlor on the station’s ground floor. Best matcha soft ice cream ever! From Nara it was a quick hop on the Kintetsu line to Osaka, where I spent the day soaking up the neon atmosphere of the Dōtonbori district, enjoying okonomiaki from Chibo and takoyaki and melon bread (with ice cream!) from street vendors. Osaka is a fun place to nosh on tasty treats and just wander, but it’s a little short on actual sights, so one day on this trip was plenty. I stayed at a luxury capsule hotel in Namba for one night. It was an interesting experience but I didn’t sleep a wink due to my neighbor’s constant coughing. I think next time I’ll spring for a hotel room with an actual door! Next morning I caught a super early budget flight to Taipei with Peach from Kansai airport and continued on to Taiwan for three weeks. Note: None of the links in this post are compensated. If I recommended a business, it’s because I loved them and think you will too. Looks like you had an amazing time in Japan, Ingrid! The pictures (of the food especially) look fantastic! Makes me want to go and explore my country more! Glad you got a chance to see Gifu which is where I am from – it`s a beautiful place! Thanks for coming to our dinner and hope to meet again one day! Enjoy your future travels! Shin, thank you for giving visitors to Tokyo such a warm welcome! It’s not easy to gain access to Japanese culture so you are providing a really unique and special experience. All the best to you and Candy and hope to see you again sometime!